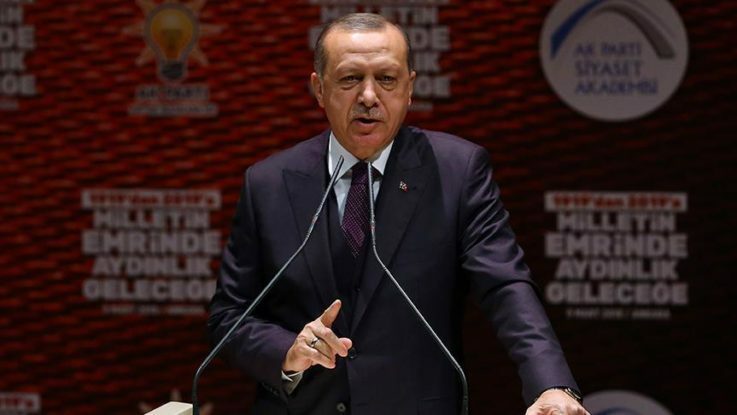 President Recep Tayyip Erdogan said on Friday that Turkey-backed troops had surrounded Afrin city center in northwestern Syria and were ready to enter at any moment as part of Operation Olive Branch. “Right now, Afrin city center is surrounded,” said Erdogan at the inauguration of the ruling Justice and Development (AK) Party’s Politics Academy in capital Ankara. He added that a total of 3,171 terrorists have been “neutralized” in Afrin since the start of Operation Olive Branch in northwestern Syria. Turkish authorities often use the word “neutralized” in their statements to imply the terrorists in question either surrendered or were killed or captured. Since the beginning of the operation, the Turkish military and the Free Syrian Army have liberated 159 locations, including five town centers, 124 villages, 30 strategic areas, and one YPG/PKK base. Erdogan noted that a total of 815 square kilometers (506 square miles) have been liberated from the terrorists so far. According to the Turkish General Staff, the operation aims to establish security and stability along Turkey’s borders and the region as well as protect Syrians from the oppression and cruelty of terrorists. The operation is being carried out under the framework of Turkey’s rights based on international law, UN Security Council resolutions, its self-defense rights under the UN charter, and respect for Syria’s territorial integrity, it said. The military also said only terror targets were being destroyed and “utmost care” was being taken to not harm civilians. “We are in Afrin today, tomorrow we will be in Manbij. The next day we will ensure that terrorists are cleared from the east of the Euphrates (River) till the Iraqi border,” Erdogan said. He said in the initial phase 2,000 square kilometers (772.2 square miles) will be taken into control.